Like it or not, cold and flu season is upon us. 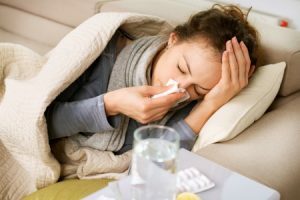 If you suffer from frequent colds with sniffles, congestion, headaches or other seasonal ailments, acupuncture can offer you some much-needed relief and keep colds and the flu at bay. Acupuncture can actually help prevent you from becoming sick in the first place by elevating immunity-enhancing hormones and white blood count (leukocytes) for up to three days after treatment. This is why you should go in for an acupuncture session before symptoms appear at the beginning of the cold/flu season. If you do catch a cold, getting acupuncture and cupping right away at the first signs can prevent the virus from settling in or shorten the duration of the cold. By getting fresh blood and lymphatic body fluids flowing throughout your body, acupuncture can help alleviate common cold and flu symptoms like chills, fever, body aches, sore throat, headaches and congestion. For example, targeting certain acu-points located over the sinus cavities can reduce sinus congestion, tiredness and headache pain. Everyone experiences colds and flu differently. Some people get a scratchy, sore throat, whereas others suffer from a stuffy nose and a pounding head. If you do catch a cold/flu, there are many Chinese herbal formulas which will clear out your symptoms very effectively. Your acupuncturist can tailor your care to your unique symptoms, using acupuncture, cupping and herbs, to get you the relief you need fast. Of course, we also recommend getting plenty of sleep, eating a nutritious diet that includes lots of garlic, onions, ginger, turmeric, chicken bone broth and vegetable soup, rinsing your sinuses with a Neti Pot, wearing a scarf and staying warm, and washing your hands frequently. Combine these tips with regular acupuncture treatments and you’ll make it through cold and flu season unscathed! Looking for a good acupuncturist to get you through this sniffly season? Check out WellStream Acupuncture. We work closely with you to restore your body to a natural state of health. Contact us to find out more and to schedule your first appointment!